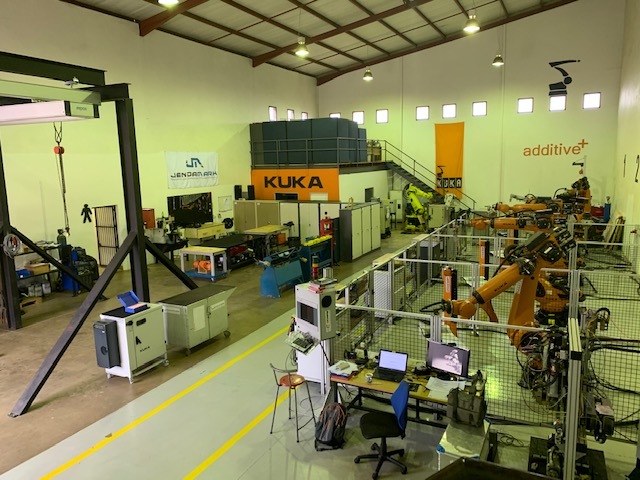 Jendamark offers KUKA robot training courses in Pretoria, South Africa, that are internationally acknowledged. Modular in structure, the seminars enable step-by-step qualification on the basis of certified quality standards. At Jendamark, all instructors provide practical training, have many years of experience and are trained in teaching methodology. To receive a free copy of our course brochure, just enter your name and email below, and we'll email you a download link to the latest copy. Success! Please check your email for your download link. The goal of this seminar is to transfer the existing robot programming and/or operating skills of the participants into the KR C4 environment. The goal of the seminar is to acquire basic skills required for programming a KUKA robot system. The aim of the seminar is to build on the basic skills taught previously and to learn the basics of the KUKA high-level programming language. KRL and apply it in structured robot programs. The participants in this seminar are trained in the fundamentals of proper fault diagnosis and troubleshooting for the electrical equipment of the robot system KR C4 including the necessary network basics for re-commissioning a KR C4 system after repair work. System integrators who have ample experience with the integration of robot systems shall be enabled to transfer their knowledge within a short time into the KR C4 environment with the focus on commissioning KRC4 systems. The topics covered on the first seminar day enable system integrators who have good skills in commissioning robots and fieldbus systems. The participants in this seminar are trained in the fundamentals of proper commissioning, fault diagnosis and troubleshooting for the option Safe Operation. If you would like to know more about our training program and courses, just complete the form below and we will get back to you.